Here is Anton with his piano from the Bicycle Built for Two scarecrow display. 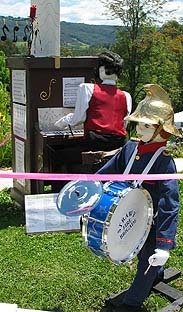 And here is Fireman Fritz from the Strawy Fire Brigade display, playing his drum and cymbal alongside pianist, Anton, in the park at the Kurrajong Scarecrow Festival. 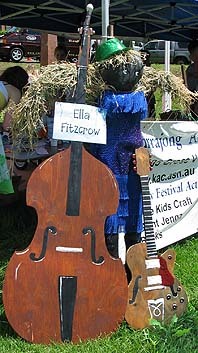 This scarecrow singer display, 'Ella Fitzcrow', features a beautifully handmade guitar and double bass. 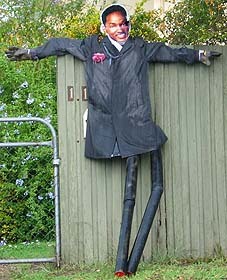 And this fun scarecrow idea shows the popular singer, Will Smith. 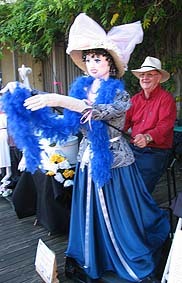 And here is an animated scarecrow Music Hall singer from the Bicycle Built for Two scarecrow display, operated by operator Alan Harvey of Milton, NSW. 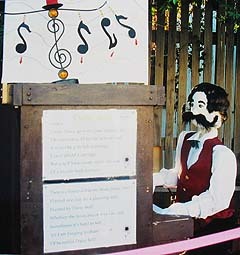 This happy strawy scarecrow is playing a hand made clarinet with the keys and details added in white paint. Here is a bush band scarecrow duet playing their fiddle and piano accordion for the Strawy Matilda Scarecrow display. Visit the Music With Ease website for pictures of these musical instruments and many more! And if your kids are having problems learning to read those tricky music notes, don't miss Betty Wagner's fun ebook, Read Music Notes With Ease. Note: This page includes musican and singer scarecrow ideas for you and your kids to make for a musical scarecrow theme: a pianist scare crow, a little durmmer boy scarecrow, famous singer scarecrows, a clarinet playing scarecrow, a scarcrow bush band and many more!